Maybe you love eating oysters, but do you also know how to shuck them? It’s not difficult and it’s not dangerous, especially when you’ll be getting guidance from some of New York’s most enthusiastic ostreaphiles! 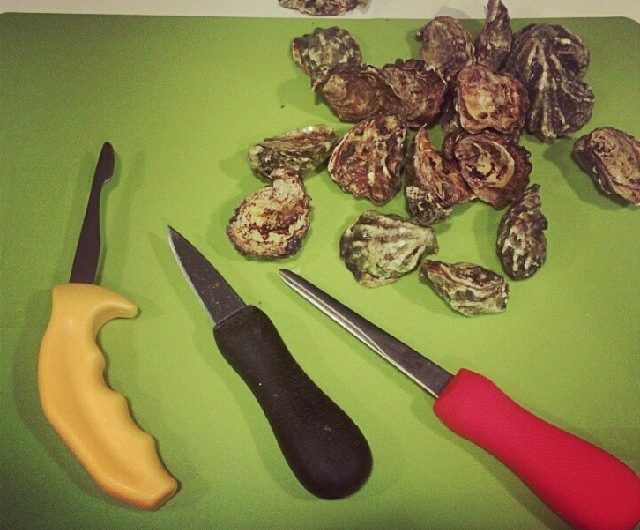 On Monday, June 23, we’ll be meeting in Soho from 6:30-8:30 pm for a shucking workshop and the opportunity to learn about oyster buying and eating at home. Each person will get 10 oysters to shuck, and there will be sandwiches, salads and other items to fill out a light supper. You can get all your burning oyster questions answered, such as: how do I shop for oysters, how do you tell a boy oyster from a girl oyster, and what’s up with the “no oysters in months without an R” adage? Many of you are already experts at shucking, so if that’s the case, come in to show off your skills and help teach the newbies. In a nutshell: You’ll get 10 oysters, dinner, wonderful oyster-centric conversation AND be able to show off your awesome shucking skills after this Meetup! This event will be $27, and the Meetup is currently capped at 18, so sign up today before we’re out of space! Note: refunds will not be issued for this event, so please be confident that you can make it.